For ages and ages and ages, as I cut 2″ strips for my Epic Modern Crosses quilt, I put aside the leftover bits thinking, I’ll have to find just the right project for these guys. They were all my favorite colors and fabrics, with so many fun little bits thrown in. And then a while back (early 2013? 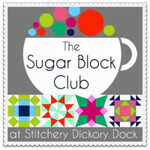 ), there was a big trend in quilty blog-land to make Scrappy Trip Around the World blocks. I mean, they were EVERYWHERE. They had their own hashtag- #scrappytripalong. I loved them, but I wasn’t in a quilty place just then. And then I realized that I could adapt the 2.5″ strips to 2″ strips with no effort, and use that fabulous pile of leftovers. Which means… time to make my own Scrappy Trip! I’ve spent the last few nights blissfully sewing strips into tubes, slicing them up, and sewing them back together. What seemed like a HUGE pile of leftover strips vanished so much more quickly than I anticipated! A few strips were too short and had to go back to the scrap heap. Out of the ones that were left, I had the most purple, which made total sense, as I had twice as many purple blocks in the Epic Modern Cross quilt as blue and green. But I was surprised that I had way more blue than green leftovers- and I made the same number of blue and green blocks. The only thing that I can think is that I used more green fat quarters than yardage, and so, not as many long strips left? I thought my scraps would go further. Which means I need to make a choice. I really love this pattern, and I’d really like to make it bed size. Which means maybe 100 blocks total, or less if I did a border. And I just finished that massive massive quilt top for my bed. Am I ready to commit to nearly 90 more blocks, and another giant project? I had meant this to be my A Lovely Year of Finishes project, and have all my blocks done by the end of the month, but that was before I realized how BIG this project would be. So what’s a girl to do?